US ▼ 2011-12-14 400pts ? (Trial Game) 2011-12-14 FREE ? UK ▼ 2011-12-14 400pts ? EU ▼ 2011-12-14 400pts ? DE ▼ 2011-12-14 400pts ? AU ▼ 2011-12-14 400pts ? US ▼ 2011-12-14 $4.99 ? EU ▼ 2011-12-14 €3.99 ? UK ▼ 2011-12-14 £3.20 ? AU ▼ 2011 $5.49 ? JP ▼ 2011-12-16 ¥450 ? (Sega Forever) 2018-02-01 FREE ? The 2011 release of Sonic the Hedgehog CD is an enhanced downloadable remaster of the 1993 Sega Mega-CD game Sonic the Hedgehog CD. It was developed by The Taxman using a proprietary game engine named the "Retro Engine", an updated version of the engine used in Retro Sonic Nexus. His efforts were picked up by Sega who published it for Xbox Live Arcade, PlayStation Network, iOS and Android devices and PC in late 2011 and early 2012. Unlike other attempts at bringing classic Sonic games to new platforms in the late 2000s (usually handled by Backbone Entertainment), this Sonic CD is neither a port of the original game nor an emulated version. It was re-built from scratch, allowing for a number of enhancements such as widescreen support, online features (such as leaderboards), filters to change the way the game is displayed and a Sonic the Hedgehog 2-styled spindash option. When the game is beaten once, Tails is unlocked. It is otherwise faithful to the original game. Other changes include reduced loading times, better scaling for the UFOs in the Special Stages, a number of bugfixes and a constant framerate of 60FPS. 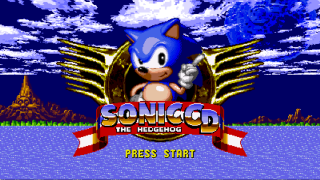 The MOGA Game Controller for Android 2.3+ featured Sonic CD as one of several compatible titles. Certain units also came bundled with a redemption code for Sonic CD. In order to play the game with the controller, the MOGA Pivot app must be installed, running in the background with the controller synced. It was released on October 21st 2012 in American territories and retailed for $49.99 MSRP. The original Sonic CD had its soundtrack changed for the North American release, leading to two distinct soundtracks for the game. This 2011 version includes both, and the user can toggle between the two. Undisclosed licensing issues mean some vocals from the Japanese soundtrack have been removed. All stage music tracks have been edited so that they loop. Some songs from the US track have been extended somewhat, using cues from the Sonic Boom album. The floating platform at the beginning with rings on it falls down after the player stands on it, whereas in the original, it stayed in place. Sound effects have been added to the pinball flippers. There's a chime before the underwater countdown begins (much like the Sega Mega Drive titles). The air bubbles spawn slightly higher. In the Mega CD version you could breathe them just by standing on top of the bubble vent, but in this version you have to jump to reach them, like in the Mega Drive titles. At the beginning of Act 3 (Good Future), the missing Sonic monitor icon from the CD Sonic 510 beta has been restored. The spotlights in the background in the present move fluidly and do not flicker. During the Metal Sonic race at Stardust Speedway, the Bad Future theme always plays in the background, regardless of which soundtrack is chosen. During the Time Attack Mode, Amy Rose does not show up at the end of Stardust Speedway; she was instead replaced by a flower capsule, most likely to save time. During the final battle against Dr. Robotnik, two "light beams" have been added to each side, which are akin to the ones at the Final Zone, Wing Fortress Zone, and Flying Battery Zone. The final boss during this level now has smooth animation sequences, most notably during the attack with only three "wedges" left. In the original, he jumped between still frames while a loud mechanical sound played with each shift as he rotated: now, the rotation is smooth and Robotnik appears to "float" while using it. The U.F.O.s that carry the Speed Shoes power-up in the Special Stage have been recolored blue, most likely to better differentiate between the purple ones, which carry the Ring power-up. In the original, this difference was only visible from a short distance, with gold stripes indicating rings and silver having the Speed Shoes. The 'warning' sound effect signifying low time starts at 4 seconds remaining, as opposed to the original's 14 seconds. Sonic kicks up dust clouds when he skids, as he does in Sonic the Hedgehog 2 and future games. Changing the Spin Dash mode also changes another aspect of the game. With the Original mode chosen, the screen pulls further ahead of Sonic when going fast or charging a dash move, as in the original Sega CD/Mega CD game. With Genesis mode chosen, the camera stays centered on him like in the Mega Drive games. The default setting is Genesis mode. The time taken for time travelling is actually a bit longer. Some objects that activated warping in the original Mega CD game do not do so in this remake. The Stage Select menu and Sound Test can no longer be accessed by code. Instead, they have to be unlocked in the same manner as the D.A. Garden and Visual Mode. The FM portion of the Sound Test is now PCM. All "past" tracks have been moved to "D.A. ", along with the rest of the soundtrack. While the debug mode is enabled, power-up monitors can be used more than once. Ring objects are now available to be placed, unlike the original. There is no background music that plays after the "S" monitor has been struck. When the Japanese soundtrack is enabled, the song that plays in the Time Attack menu is completely different from the one in the original game. However, the song is not entirely new: it is an instrumental remake of "Brand-new World" from Sonic the Hedgehog - Remix, a CD that was released in 1994 to accompany the original edition of the game. Entering the code "PCM: 32, DA: 8" on the Sound Test briefly shows a mock-up image of "Desert Dazzle", a stage that was once planned for the remake. It also enables Tails while choosing a stage from the Stage Select menu. A new end boss stage named Final Fever was never implemented in the 2011 remake of Sonic CD. Rather than the Time Attack theme being used after entering the code for accessing hidden pictures, the Quartz Quadrant Good Future theme plays instead. In order to access the Special Stage Time Attack, the player has to select the "Next" icon, rather than pushing left. Certain mobile versions of the game have haptic or "rumble" feedback. Tails has his moveset from Sonic the Hedgehog 3, allowing him to get to areas that Sonic cannot normally access without the use of time travel. Tails cannot use the Super Peel-Out. The opening cutscene has been disabled. Rather than a voice clip being used after getting a 1-Up, the Time Stone/Badnik Teleporter sound effect is used instead. Amy Rose has been removed entirely. As such, neither she or Metal Sonic will show up at Collision Chaos Zone 1, and the spin tunnel path is opened by default. She has been replaced by a flower capsule at Stardust Speedway Zone 3, much like the Time Attack mode. As with the opening, the ending cutscene was also removed, and replaced with a credits screen. Unlike Sonic's game, which lists the original staff, this one lists the staff who worked on the remake. Standing idle for three minutes doesn't result in the loss of a life. stated that there should be such an update for iOS-based platforms but that he cannot say either way whether this will be possible on the home consoles, due at least in part to the large cost of having updates validated and rolled out on their digital distribution services. When the Sonic CD Spin Dash is enabled, there is a delay in speed after striking the Speed Shoes monitor. Collecting one more ring after time traveling (after already collecting a hundred or more) automatically earns the player an extra life. After Sonic or Tails touch the reverse-shrink ray and change into their regular sizes while invincible, their invincibility immediately wears off. For unexplained reasons, the third act of a Zone will sometimes lead to a Bad Future, even with all Time Stones collected (but strangely enough, the stage clear text still acknowledges that a Good Future was created). If the player dies while in a stage with water, the drowning sound will still play.